Earn $2.10 in VIP credit (210 points)What's This? Replacement disc brake pads for all Avid Juicy hydraulic disc brakes and Avid Ball Bearing 7 (BB7) mechanical disc brakes. Easy to replace with just your hands. Available with Metal Sintered or Organic compound with steel backing. The Organic compound is quieter than the Metal Sintered compound, but has less pad life because they are a bit softer. Includes spring. 1 pair outfits 1 brake caliper. Purchase 2 Qty to outfit 2 brake calipers. Exact fit as expected for OEM parts! Fit my Avid brakes perfectly. Much smoother and quieter than the old worn out pads. As a roadie, I have little experience with disk brakes. These are my first. I was impressed by how remarkably easy one can change them out in the field. I carry a spare set on all my multi-day tours. Gotta have 'em or your disc brakes won't brake! this is my first replacement, 1st set lasted 4 years of 5 days per week, all year florida). They took one-two rides to break in but they work great now. 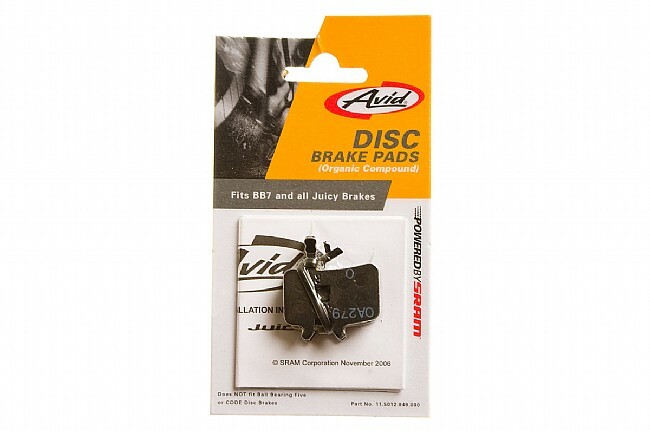 I use Avid JuicyBB7 Disk Brake Pads on my Volagi Liscio & Trek Portland. I can break with much more finesse i.e. don't over or under brake. Perfect on wet Portland streets. Also a big plus on a huge downhill run where caliper brakes are smoking and overheating the rims, the disk brakes have no probs. Works great, what more to ask. Brake pads arrived quickly and exactly as described. These brake pads are use on the parking brake (rear wheel) of my recumbent trike. Therefore, they will not get as much wear as normal brake pads. I expect them to last a very long time-barring any chipping or damage. They are very easy to install. Don't stress about changing your own disc brake pads-it's pretty easy. I recommend the organics, but it's true the metal sintered do last longer. Order a set, watch a YouTube video and give it a try. You can do it. There are tons of videos on YouTube to walk you through it. I have used both the organic and metal pads and really prefer the organic-much smoother and quieter. I use the organic pads as I find the quieter than the metal pads. 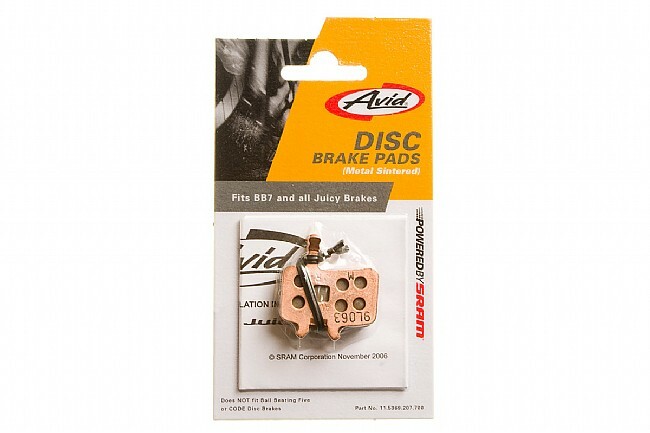 I have avid mechanical brakes and I would only use avid pads. Other brands are not as good.